How to Watch Sky Go Outside the United Kingdom? There are literally hundreds of TV shows that you can watch in the UK. Unfortunately, most UK content are bound by certain licencing copyrights making them only available to view in UK’s geographic territories. Sky UK Limited is one of the most popular British television companies. Sky is also UK’s largest video-on-demand broadcaster with an estimate of 11 million customers as of this writing. Sky offers a wide range of content which is why a lot the British people are subscribed to it. The company recognised the increasing number of viewers opting to watch their favourite shows online. So in 2006, Sky Go was born. 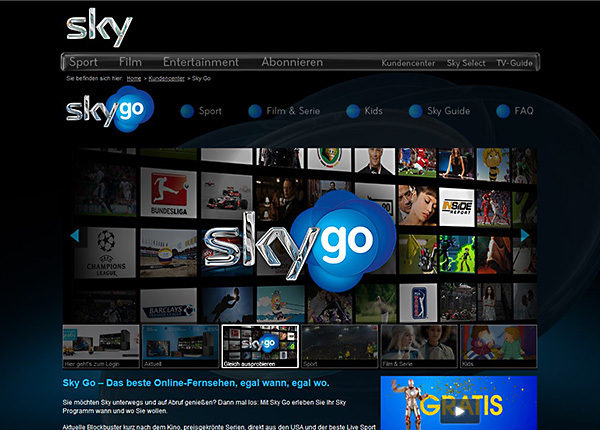 Sky Go is a pay-TV service offered by Sky UK Limited. Sky Go is available at no extra cost to Sky TV subscribers. For non-Sky TV customers, they will need to subscribe on a pay-per-view basis to get access to Sky Go. Sky Go content includes sports, news, movies and Sky TV shows. Is Sky Go available everywhere? If you are trying to watch a certain TV show from Sky Go’s video library, you might just end up disappointed. At the moment, Sky Go is only available in the UK. Sky Go is a region-based type of service and is only available for internet users in the UK. So, if you’re attempting to watch Sky Go in the US, you will only be welcomed with a message saying that you are in a geographically restricted location that Sky Go don’t operate in. Sky Go is able to determine which users are from the UK, and which ones are outside the country. This is possible because Sky Go can see your unique IP address. Whenever you access Sky Go, you are requesting connection to their server. Such request will send your IP address to Sky Go. This IP address is basically a data describing your actual whereabouts. Meaning, if you don’t have a UK IP address, Sky Go will automatically block you from accessing its video library. No matter how many times you try watching on Sky Go, you will never be successful since Sky Go knows exactly where you are sending the connection request from. There is no straightforward way of accessing videos on Sky Go. But there is a workaround to this geographic restriction. What you can do is to trick Sky Go into thinking that you are virtually in the UK even if you are actually elsewhere. If you can mask your real IP address with a UK IP, then you can enjoy the numerous content offerings by Sky Go. There are different tools that you can use to bypass Sky Go’s geographic restrictions. One of the oldest ways of unblocking region-blocked contents is by using a proxy service. Proxies, however, haven’t been that effective in recent years. Streaming media and video-on-demand services can now determine proxy requests so therefore they automatically block such requests already. You have two choices to unblock Sky Go: either you make use of a VPN or Smart DNS. These tools are great for unblocking geo-graphically restricted contents. VPN is the more popular option primarily because it provides encryption allowing more secure and private internet activities. Smart DNS services on the other hand are great for unblocking streaming media. Smart DNS is specifically designed to bypass all types of restrictions imposed by streaming services. Youll find more on Watch outside UK. If you’re travelling outside of the UK, you can still tune in to your favourite Sky TV shows abroad. Ideally, you should subscribe to a VPN service that has a server in the UK so you can still access Sky Go. Most VPNs in the market offer UK servers anyway. You should also consider the reliability of the VPN service you’d be subscribing to. Since you’ll be streaming video content, you’ll need a fast and stable VPN connection. Once you have purchased a VPN service, you can then set it up on your preferred device. We recommend looking into the VPN services and opt for the one that offers a variety of compatibility. It’d be great if the VPN service provide a dedicated VPN client app for PC and mobile devices so it would be hassle-free to make the VPN work, all you’ll need to do is to install it and you’re good to go! Select a VPN service and subscribe to it. Setup the VPN by installing the necessary VPN software. After setup, run the VPN app and select a UK server. Connect to Sky Go and enjoy your unrestricted access. Smart DNS services are ideal to use for unblocking region-based streaming websites like Sky Go. Smart DNS services also unblock blocked content from any country in the world. With encryption lacking in Smart DNS services, the connections tend to be a lot speedier. You can stream HD content without encountering speed slowdown issues. To access Sky Go abroad using Smart DNS, follow this brief guide. Select a Smart DNS service to use. *Check for VPN providers offering both VPN and Smart DNS services. Navigate through your device’s Network or Internet settings. Configure your LAN connection. You will need to edit the Internet Protocol Version 4 (TCP/IPv4) properties. Then input the correct Primary and Secondary DNS server details that were provided by your Smart DNS service provider. That’s about it. You’re now ready to access unblocked Sky Go content! It’s relatively easy to setup your Smart DNS on your preferred device. You don’t need to be technically inclined to be able to configure your machine with the proper DNS credentials. Please check with your provider on how to properly setup your DNS connections. What’s great about Sky Go is that it allows subscribers to view their favourite shows on their PCs or smart phones. If you ever miss an episode of your favourite sporting events perhaps, you can always watch the replays on Sky Go. So whenever you’re travelling abroad, you can still watch any Sky shows by using a VPN or Smart DNS service.